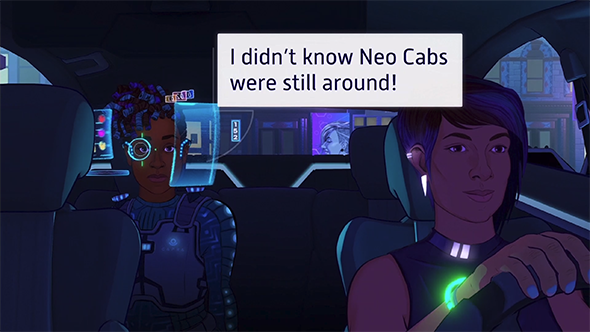 Clips of Neo Cab have been doing the rounds on Twitter for a while but the E3 2018 PC Gaming Show has given us our first in-depth look at the game’s sci-fi world. Billed as an “an emotional survival game about gig labor, tech disruption, and the experience of being a driver-for-hire.” You are Lina Romero, one of the last human cabbies in a futuristic world of automatons. Your job is to use the Neo Cab app to find fares around the neon-drenched city of Los Ojos, balancing your cash, star rating, and emotional health so as to keep your job and buy time in order track down a missing friend. While your taking them to their destination you can engage with them to learn their story. Neo Cab will also feature random encounters, a “persistent, nuanced emotion system”, and an original soundtrack by Obfusc (Monument Valley, House of Cards). If you’d rather there’s also a Neo Cab story trailer, which you can watch below. Indie studio Chance Agency are behind Neo Cab and are releasing the game on Steam and itch.io. As excited as we are are to get our hands on this gorgeous sci-fi indie, no release date is listed for it.